This recipe ensures that you’ll avoid all the common pitfalls of a mediocre macaroni salad. Deliciously creamy, moist, packed with flavor, the right balance of ingredients, the perfect texture, and visually beautiful, this macaroni salad is simply the BEST! I know I don’t have to tell you this one simple truth, that not all macaroni salads are created equal. Just go to any potluck and sample a dozen different macaroni salads, each a “secret family recipe passed down from Aunt or Granny [so-and-so]”, and you’ll know exactly what I mean. 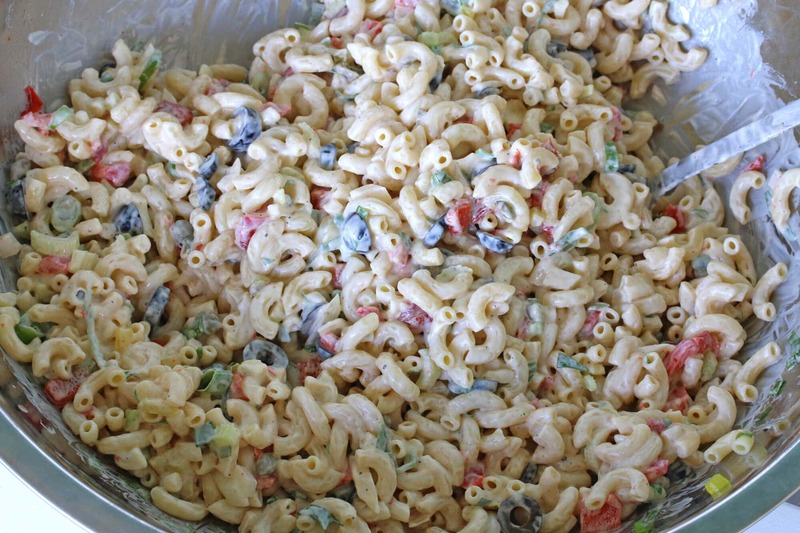 Macaroni salads tend to be the victims of four cardinal sins: 1) Not enough mayo and too darn dry (you can’t be chintzy and expect good results), 2) Not enough flavor (it may be called “macaroni” salad, but that doesn’t mean it’s only about the macaroni). Flavor and color are needed to keep things interesting. 3) The noodles are too mushy (keep them al dente so they have a good, chewy texture). 4) Not enough salt. Carbs – potatoes, pasta, legumes, etc – soak up salt like nothing else. Keep in mind, the word salad comes from the Latin base word sal which means “salt.” So don’t be afraid to be generous with the shaker. Another item to consider is that while macaroni salad tastes best a couple of hours later after the flavors have had time to meld, it doesn’t make the ideal leftover food the next day because those noodles are thirsty and they’ll continue to soak up liquid, leaving you with a dry salad. If you are going to have leftovers the next day I recommend adding a little more of the mayo sauce before serving. We’re going to avoid all of these pitfalls and create a macaroni salad we can be showcase with pride! Have you ever wondered where macaroni salad got its beginnings? The terms “macaroni salad” and “pasta salad” have different meanings different places, but generally, at least in the U.S., creamy noodle salads are referred to as macaroni salads whereas oil/vinegar based ones are called pasta salads. Pasta salads really started taking off in the U.S. in the 1960’s but macaroni salads go back to the early 20th century with one of the first known published recipes being in 1916 in the book Salads, Sandwiches and Chafing Dish Recipes by Marion Harris Neil. In that early version the author calls for horseradish and heavy cream as the base for the macaroni salad. While pasta obviously didn’t originate in the U.S. and pasta salads are popular worldwide, the traditional creamy macaroni salad is very much an American classic. 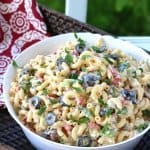 Here is a macaroni salad you can proudly take to any picnic, potluck, or family gathering and you’ll undoubtedly be asked to share your secret recipe! Deliciously creamy, moist, packed with flavor, the right balance of ingredients, the perfect texture, and visually beautiful, this macaroni salad is simply the BEST! We’re enlisting the flavor-boosting help of three Lindsay products: California Ripe Sliced Black Olives, Roasted Red Peppers and Capers. The deep black of the olives add a nice color contrast to the salad along with a pleasant nutty flavor. The roasted red peppers add a bright, vibrant color while infusing the salad with a delicious smoky element. If you prefer more “crunch” to your salad than the celery alone provides, feel free to also add some chopped fresh red bell pepper in addition, but don’t leave out these wonderful roasted peppers. Capers have a deliciously pungent flavor and aroma all to their own and add some wonderful brininess to our salad. You’re going to love the blend of flavors these ingredients, along with all the others, add this wonderful macaroni salad! 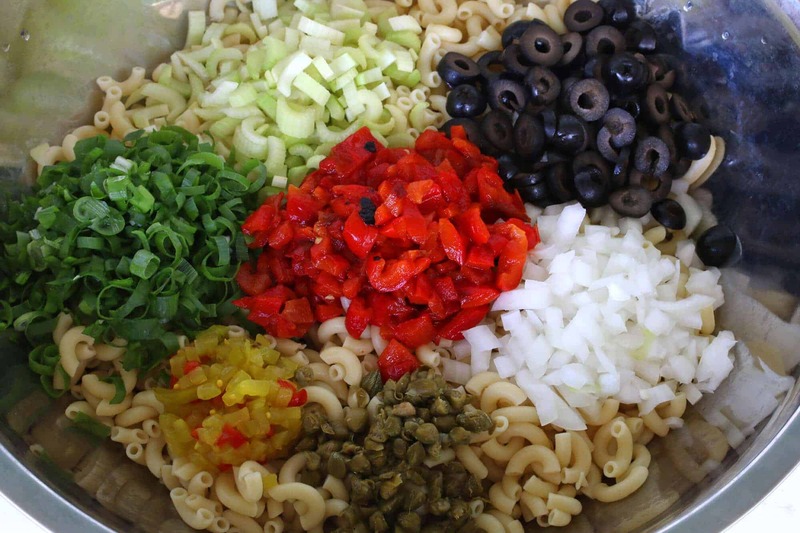 Place the cooked and thoroughly cooled macaroni noodles in a large mixing bowl along with the celery, green onions, olives, roasted red peppers, capers, relish and onions. Toss to combine. Next combine the sauce ingredients in a medium sized bowl. Pour the mayo sauce over the pasta salad and stir to thoroughly coat the pasta. Add salt and pepper to taste. If it doesn’t taste excellent it needs more salt. Transfer the salad to a non-reactive bowl, cover and refrigerate for at least 2 hours before serving. Don’t skip this wait time, it’s crucial to the flavor fo the salad. Serve as a side the same way you’d serve coleslaw with your favorite barbecued foods (steaks, chicken, fish, sausages, hot dogs, hamburgers, etc) and a green salad or, for a lighter alternative, serve with roasted vegetables, rolls and sliced fruit. Enjoy it at home, outside, at a potluck or on a picnic! This recipe ensures that you'll avoid all the common pitfalls of a mediocre macaroni salad. Deliciously creamy, moist, packed with flavor, the right balance of ingredients, the perfect texture, and visually beautiful, this macaroni salad is simply the BEST! Place the thoroughly cooled pasta in a large mixing bowl along with all remaining ingredients, except for the sauce. Stir to combine. To make the sauce, place all the ingredients in a medium-sized bowl and stir to combine. Pour the sauce over the pasta salad and stir to thoroughly coat the pasta. Add salt and pepper to taste. (If it doesn't taste excellent it needs more salt.) Transfer to a non-reactive bowl. Cover and chill for at least 2 hours before serving (don't skip this step, it's crucial for the optimal flavor of the salad). Pasta absorbs a lot of liquid over time and will dry out, so if serving leftovers the next day, add a little more mayo sauce. Thank you to Lindsay for sponsoring this post and to my readers for supporting the brands that help make The Daring Gourmet possible! I love a great macaroni salad and your recipe looks just delicious. It will be perfect for the upcoming holiday weekend gather, YUM!! I love pasta salad, mix many vegetables as I could find. Mostly I simply dressing them with thousand island …YUM. thx for remind me to make another big bowl of this. My husband makes a wonderful, very simple macaroni salad, which is the only one I’ve ever really liked. We both enjoyed your list of cardinal sins in making macaroni salad – my husband avoids all of them when he makes it (except the color, because his has only 5 ingredients: macaroni, mayonnaise, celery, onion and hard boiled eggs). 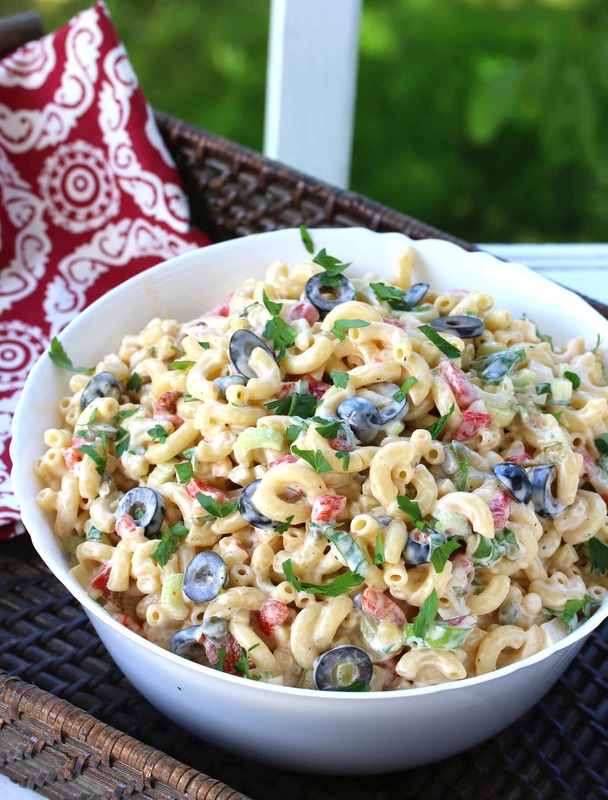 This macaroni salad is just the way I like it–LOADED! This is the perfect macaroni salad!! YUM!! I love your loaded macaroni salad! And I agree that the mayo to pasta ratio is VERY important! It needs to be just right! 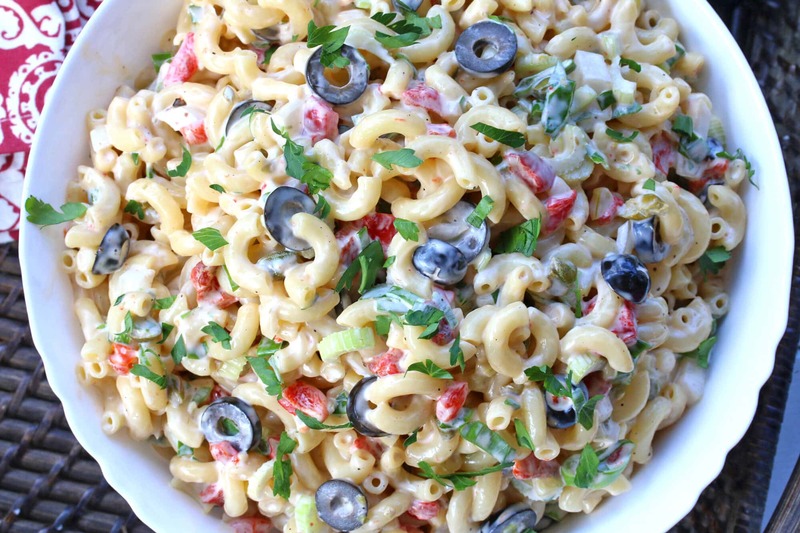 Wow, I’ve never put olives in my macaroni salad, but that looks amazing. So great for a bbq or potluck! I never knew that about the origin of the word salad! I bet the olives add a nice salty flavor and love the idea of adding roasted red peppers to macaroni salad. This looks delicious! What a great looking salad — I especially love those olives! Loved learning about the background of pasta vs. macaroni salad! Wow that looks so good. I m going to make it for our Labor Day Barbecue. What a great way to end the summer with a delicious macaroni salad. Terrific, Peggy, have a great Labor Day! I’m all about a creamy macaroni salad, and I love all your add-ins for yours. Especially the capers! I LOVE capers! This macaroni salad does look absolutely perfect! I love the flavors and colors! This looks like the creamiest macaroni salad ever! Looks delicious! A little trick I leaned to keep a macaroni salad from ending up dry is to mix everything together but the sauce, coat it all with 3-4 tablespoons of extra virgin olive oil. A couple hours before serving mix the sauce in. The olive oil keeps the sauce from soaking into the macaroni. Last for several days the way. This trick works great when I want to get a few things done the day before. That’s a great tip, thanks. I do that when I’m making certain Italian pasta dishes that are going to be tossed in a sauce but it hasn’t occurred to me to try that with macaroni salad – brilliant! For non-Italian pasta salads, you can soak the noodle in some cold milk once they’ve cooled. It also help with the dry factor without adding an oil to a non-oily salad! Thanks for the tip, Lorelei! This salad is so bright and colorful — can’t wait to try it! 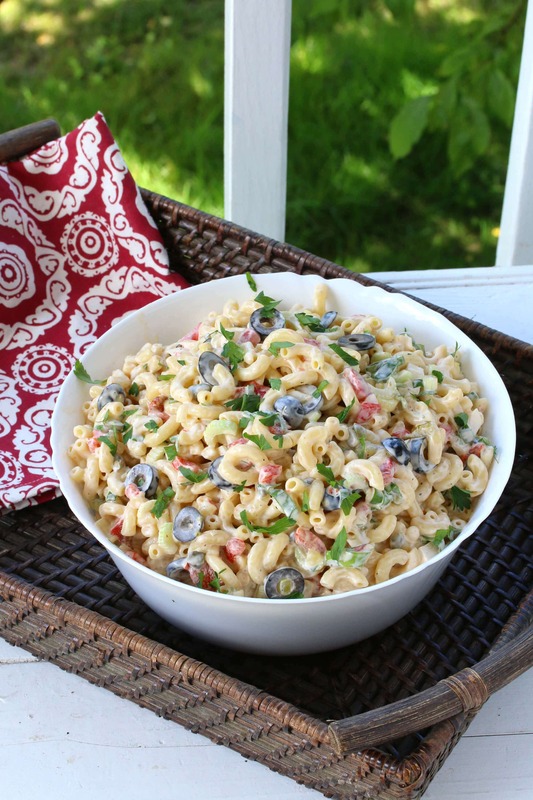 Macaroni salad is one of my family’s favorite summer barbecue dishes! 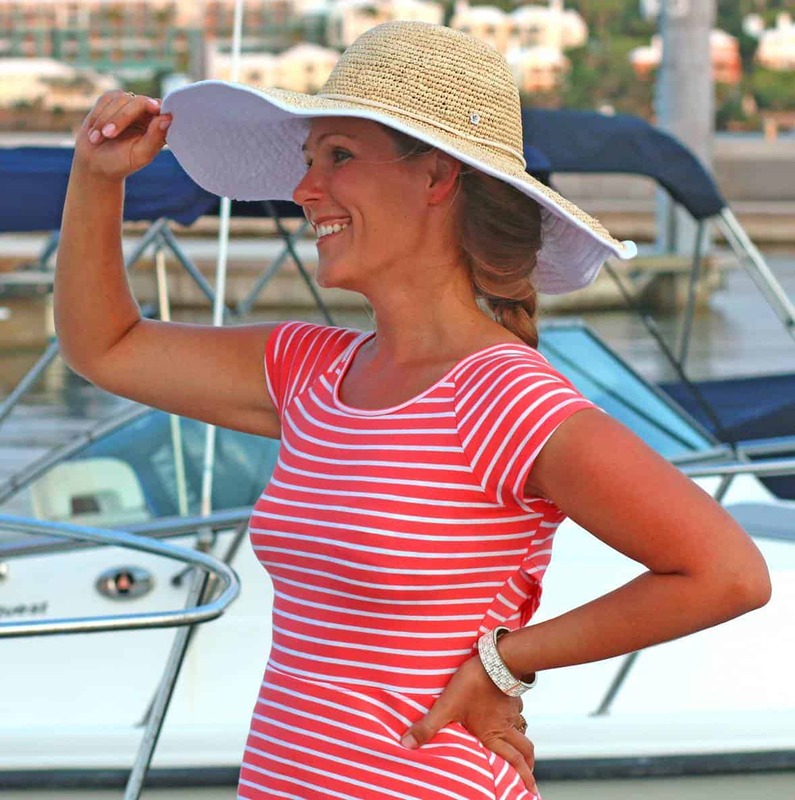 Thanks for sharing this in time for our last few barbecue weekends this year! 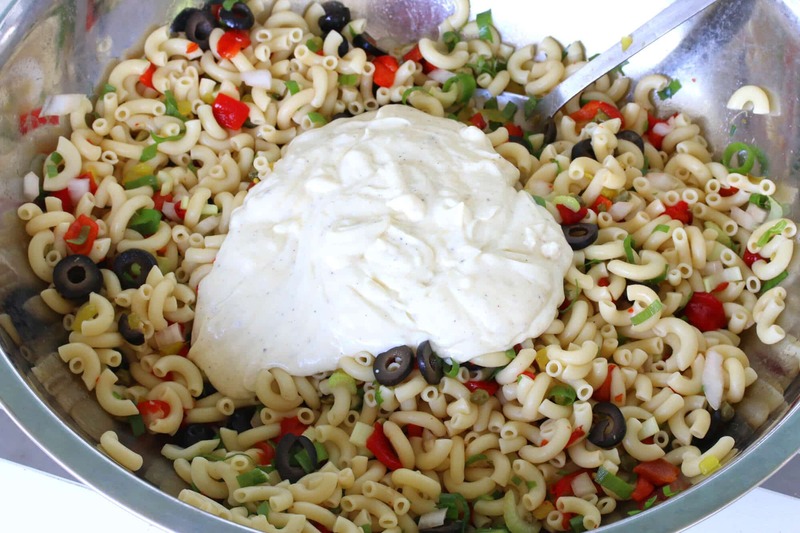 This macaroni salad has some great Mediterranean flavors in it – love it! I adore pasta salads with black olives. And capers – you found the way to my heart! I would happily dig into this at any backyard bbq. I love your 4 cardinal sins of mac salads. Totally agree! I’m on the eternal hunt for the perfect macaroni salad! This does look incredible, I love all of the goodies you’ve incorporated. Another must-try from your kitchen. For me, a creamy macaroni salad is a must. This looks fantastic. I know I’d love it! I love macaroni salad. This one looks like a keeper. Loving the addition of black olives. 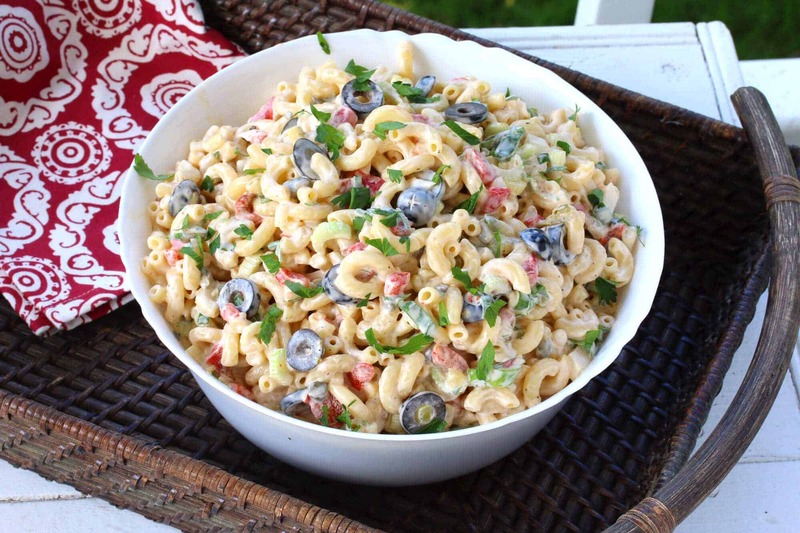 Macaroni salad is one of my favorite summer treats… and yours looks so vibrant and tasty!! This looks awesome! Perfect for a picnic. This looks seriously perfect! Love pasta salads as a side dish! This is loaded with so much goodness! Thanks for sharing this wonderful recipe with us. I like it for the fact that it’s simple to prepare. Now i have something better to try out with my kids at prep time.Kudos!!! That salad looks “AMAZING”, and I love Macaroni (loaded) salad. I would just add hard boiled eggs to it. Thanks, Marie! Some eggs would be a nice addition. I made it and I love it so did my Filipino husband who is very particular about food. I am taking it to my family Christmas dinner. Great recipe. Looks like the perfect macaroni salad! We have these at potlucks all the time! YUM!! This IS the best! It’s become my go-to recipe for mac salad. Thank you! Hi all, I just made this salad for a BBQ today. I did everything per the recipe but omitted the olives because my husband doesn’t like them and felt like I was already testing the waters with the many different flavors. I will openly admit this salad put me a little out of my comfort zone not in a bad way but just very different than my usual merging of flavors. With all that said we both just tasted it. I let the sauce sit in the frige overnight and let the salad sit with other ingredients also overnight. I just put it altogether. We both found it just a bit too tangy. I can’t put my finger on what ingredient specifically. Are there any suggestions to soften the tang? My thought is that it’s the mustard but I can’t be sure. Other than the tang it looks beautiful and it’s really good. I would make it again but maybe only use 1tbl of the Dijon and see if that reduces the tangbut for now, anything I can do? Hi Joan, since you omitted the olives I’m not sure what would be making it overly tangy as there’s only a tablespoon of vinegar and Dijon mustard tends toward the sweeter side. It may have to do with whatever brand of relish, capers and mayonnaise you’re using. Other than that, if you think it tastes a bit too tangy you can go with sweet instead of dill pickle relish. I made this yesterday for a family BBQ and everyone loved it. SO good! I have found the secret to a truly great Macaroni Salad is using Trader Joe’s Elbow Macaroni. It’s slightly larger than the normal elbow and has ridges. It’s simply called “Trader Joe’s Italian Macaroni” – no elbow mentioned. I’ve tried to find similar elbows in grocery and specialty store, but no luck. Deeelicious! Made this last weekend for a family bbq get-together and not a single elbow macaroni was left :) This will be my go-go for macaroni salad from now on, thank you! That’s terrific, Candace, thank you! Agreed – the best! I’ve made many macaroni salads in my day and this one has it all. Love the flavors and colors. Thank you! I just finished making a macaroni salad and then found your recipe!!! Your recipe looks, and sounds amazing by all of the comments I read. I will definitely make it next time. Thanks for sharing. Thank you, Diane, I hope you enjoy it! I don’t care what anyone says about this pasta salad – Its very simply THE BEST PASTA SALAD IN THE WORLD. I don’t know who invented it but just with the ingredients alone you can tell it’s great! I’ve never been a huge fan of pasta salad as it’s usually the same old boring stuff – you know, mayonnaise, mustard, celery, olives, just the basics to get by. But I’ve made this 3 times now and people who I could never entice to eat pasta salad can’t get enough of this. Once you try this you’ll never ever make any other kind. It’s to die for🤗. I have a simple question do you use the small elbow macaroni or the large elbow macaroni what is best for macaroni salad? Hi Veronica, I prefer small and generally reserve the large size for other dishes like soups. Oh one other question, I’m making salad for about 20 people … is 1lb enough or should I do 2 lbs? Hi Veronica, one batch uses 1 lb of macaroni and that feeds about 6 people, so doubling the recipe (2 lbs) will feed 12. But if this is part of a potluck with plenty of other dishes, doubling the recipe should be adequate. Listen up folks, this recipe ROCKS! adds those to her anchovies list of dislikes. her wishes, but sneak a little in for my portion. definitely kicked it up a notch. My first time here, but certainly not, my last. Fantastic, Lance, thanks for the feedback and input and we hope to see you again! This is how I make mine but I cut real small pieces of broccoli and cauliflower in it. P.S. I don’t know why but, I was not able put in my rating. The stars would not highlight! I was trying to give this recipe 5 stars. Sorry Kimberly. aha, I got it, I had to sign up for the newsletter, then it let me rate the recipe! (I wondered why there weren’t more ratings, maybe they had trouble as well.) Thank you Kimberly, for the delicious recipe. Wonderful, Bonny, I’m so glad you enjoyed it, thank you! I’m glad also that you discovered that weird glitch with the star ratings because it’s not supposed to do that, now I can try and fix it! Excellent salad. I’ve read all the comments so far, and I agree with some of them: EGGS are a nice “enriching” addition. finely diced “spicy dill pickles” (but not Kosher: too funky) are good. Our family uses canned pimentos, for a richer turn on things. My next-door neighbor, being from former Yugoslavia, uses “Ajvar”, which comes in cans. It too is quite good. My recommendation is to ADD VINEGAR BY TASTE… you can do this at the very end. Mix up everything except the vinegar. Taste, and decide… a bit more tartness or not? Can’t take it out! But its easy to add. Also use TWO LARGE SPOONS to mix. Lifting from the bottom and cascading over the top. Does the least damage to the salad, keeps it from becoming a solid mass by accident. I’m glad you liked it, GoatGuy, thank you, and thanks also for the tips! Outstanding! Big hit, will be making this recipe from now on. Woohoo!! I’m so happy to hear that, Jocelyn, thanks so much for the feedback! This is my second year making this for our 4th of July party and I just wanted to tell you how much we all love it. It has become my go-to recipe every time I need a macaroni salad. Thank you! I’m so glad to hear that, Tanya, thanks so much! I have made this salad at least 4 times for various potlucks and it’s always a hit. People always ask me for the recipe and I refer them to your blog :) Love your recipes, I’ve made many of them, keep up the delicious work! Sounds like a fantastic recipe. I plan to try this for a party today. Not particularly fond of capers or black olives but love sliced green olives in Mac salad. Do you think green olives would be ok to add in place of capers and black olives? Hi Bekka, you bet. This all purely comes down to personal preference – black olives are simply milder but it you like green olives feel free to use those. OMG! I just made this today for the first time. Absolutely delish! 😋 Did not change a thing. I think the key to this recipe is to use a good quality mayonnaise, just like the recipe calls for. I splurged and bought a jar of mayonnaise from a boutique delicatessen in my neighbourhood and paid $10 (big cringe!) for it. But what a difference in taste compared to the regular big name mayonnaises that can be found in every grocery store. I also used a good quality sweet pickle relish. I highly recommend making this dish. I’m so glad to hear that, Sabine, thank you for your feedback! 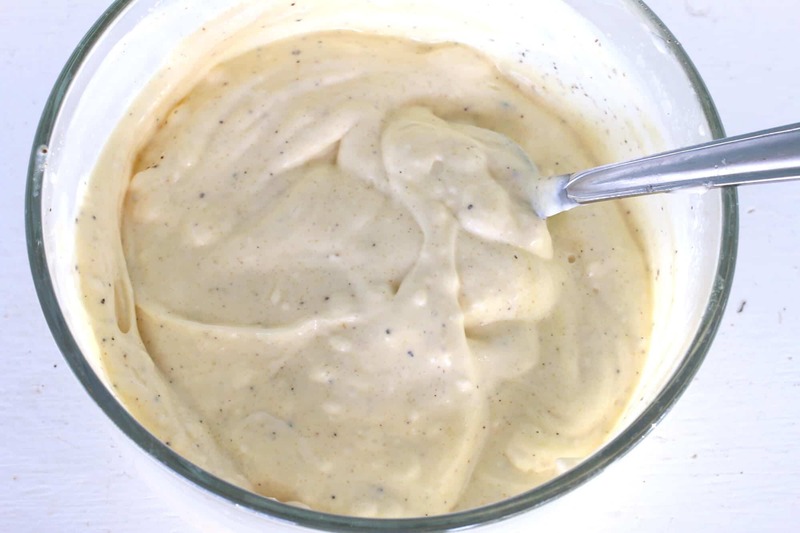 I switched up the ‘mixings’ to appease the kiddos a bit…but the dressing on this is hands down – AMAZING! I hate store bought macaroni salads cause of the weird flavor. I have my potato salad recipe perfected so it’s usually my go-to, but I wanted to change things up a bit this summer. I was nervous to try to make macaroni salad, but knowing all of your recipes are awesome I tried this out – and it (the dressing) is simply perfect! You’re a gem, Stephanie, thanks so much for the compliment! :) Have a terrific weekend! 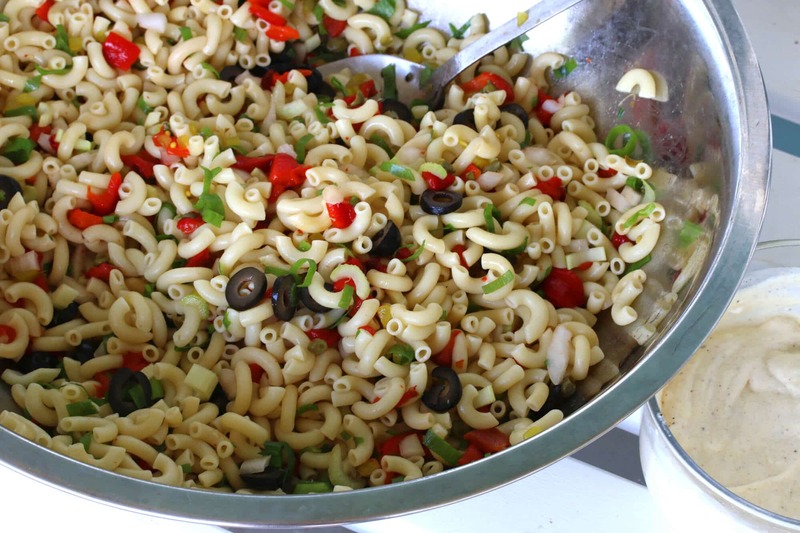 The perfect pasta salad for any cook out! Made this over the weekend, we loved it! We love this creamy classic macaroni salad! I LOVE Macaroni salad, this looks incredibly delicious!! A must try recipe!! This is perfect for a side dish for BBQs!